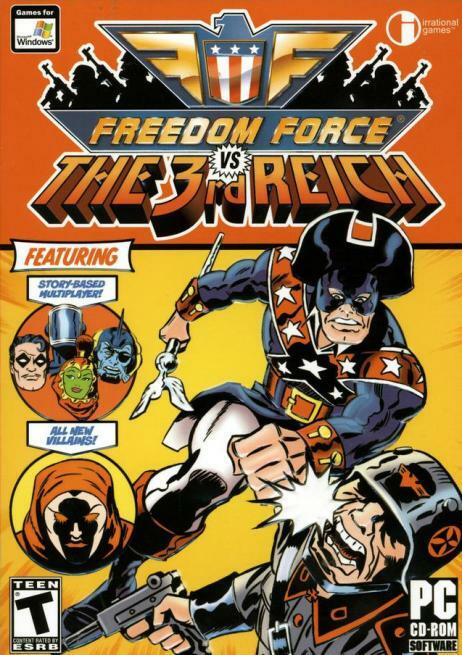 Freedom Force versus the Third Reich (FFvsTTR) is the sequel to the team-based role-playing superhero game Freedom Force. Set in the 1960s during the Cold War, this game looks and feels like a comic book from this period, referred to by comic book fans as (The Silver Age) of comics. Although I haven't read a comic book in over 15 years, I can still recognize that these games are a very intentional homage to classic comic books. The game's many heroes are superhero archetypes, from the freedom-loving Minute Man, to the blazing fast Bullet, to the anti-hero Tombstone. The classic storyline and dialogue, and archetypal superheroes, give the game a familiar feel to anyone who has ever read a comic book. The game's introduction made me laugh out loud with its somewhat kitschy cut scenes and dialogue, but I soon found myself drawn in to the deadly serious storyline. The game's storyline is one of the great strengths of the game, and is, in my opinion, one of the best computer game stories ever. As with the previous Freedom Force title, the game begins with the heroes battling super villains. Both the heroes and villains have been exposed to Energy X, an alien chemical that imbues humans with super powers. The arch Soviet super villain Nuclear Winter has returned and is attempting to cause a nuclear war and Freedom Force must stop him. In the process of doing so, the super villain Time Master is freed by a Nazi villain Blitzkrieg. With Blitzkrieg then using Time Master's powers to travel back in time to give Energy X to the Nazis, Freedom Force must also travel back in time to stop him. Throughout the game you will control a team of up to four superheroes. The action is all in real time, but can be paused at any time to issue commands, so it never feels frantic. The game's controls are very easy to master. Left clicking the mouse on an enemy will make your team of heroes use their default attacks, while right clicking will give you a drop down menu of which attacks you want to use. You will want to right click often, since each hero possesses unique powers that are all fun to use. Since you will have to issue mouse commands individually to each hero, the game pauses each time you right click and issue commands. Overall, I really liked the interface for this game. I was expecting more of a Warcraft III type command interface, but for this type of game the command interface was superior. However, I do wish that it were possible to change the default attacks of some of the heroes. It would have definitely streamlined some of the combat. For a number of the superheroes, the default attacks are the weakest option. Minute Man and Tombstone, for example, have far superior melee combat attacks than ranged attacks at the beginning of the game, but they are forced to use ranged attacks as their default. There are only a handful of keyboard commands that you will have to use in the game, such as the obligatory escape key to bring up save or load game options. You can also change camera angles, and select heroes using the keyboard, but the game is almost entirely mouse controlled. One of the great strengths of this game was the great selection of unique heroes with unique powers. I was pleasantly surprised at the total lack of redundancy with the heroes. With nearly 20 heroes to choose from with as many as a half dozen powers to choose from, all the heroes were unique. By mixing and matching the superheroes within your team, you'll find that certain teams possess different unique strengths. A number of missions won't give you the opportunity to select your heroes or only a limited number of heroes can be chosen with the rest being pre-selected for you, which forces the player to learn the powers of a large number of the available heroes. In addition to the huge selection of heroes available, players can also design their own heroes. This gives the game considerable replay value, although you'll still have to bring along some of the pre-generated heroes during some of the single player missions.